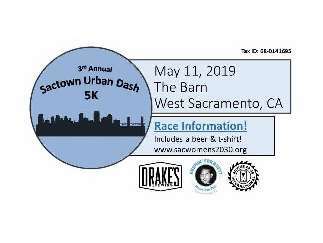 This year, the Sactown Urban Dash is a 5K race through West Sacramento, starting and finishing at The Barn in West Sacramento. It will be officially timed by Synergy Race Timing, for those interested in clocking their run. Racers receive a complimentary beer/beverage and a tank top or t-shirt with the purchase of a ticket by April 1. Immediately following, an after-party will include music and a raffle. Additional food & drink will be available for purchase.